Go green! …screen that is! Why use a green screen? Aside from looking really cool and professional! A green screen allows you to control your environment; you can shoot a video in ANY location in the comfort of your own home or office! …on a beach, in a corporate boardroom, in front of the great pyramids.. Heck, even on the bridge of the Starship Enterprise if you want! You just film the video, remove the green background using chroma key software (like Adobe After Effects) and replace it with whatever you want. No, you don’t need to know 3D animation or CGI, a plain old image will do fine for the background. Where do I get a green screen? You can go big and purchase a professional chroma key green screen online or at a pro camera shop; but seriously, you don’t have to. A bright green matte fabric from your local fabric store will do just fine (don’t use fluorescent green poster board, it reflects too much light and makes the keying process difficult). It’s really that easy!! If you produce your own marketing and business videos on YouTube, I hope you will give green screens a try! It’s a lot of fun and gives your videos a whole new dimension! 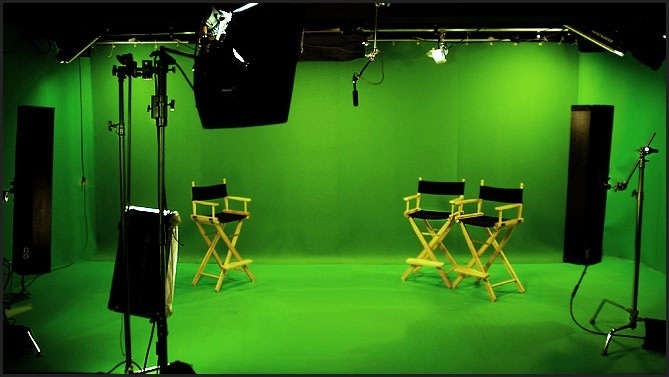 Contact us to produce your own green screen video, we can help!